The year is 1991. I’m trading Australian interest rates on the proprietary desk for Bankers Trust. The desk is headed by Richard Farleigh. And the quarterly CPI number is about to be released. In those days, there was 3 opportunities to “trade” a CPI number. First our economist, Andre Morony, would provide his forecast for the CPI. He would look at petrol prices, fruit and veg, the currency, the trend and so on, and would do very well, particularly against his peers. So we could position for a market response in interest rates following a particularly high or low CPI. Often that worked very nicely indeed. Post the number, to identify the trend in inflation, economists (and the RBA) used to focus on the “core” measure, or what inflation was when you took out the volatile items like petrol and food. 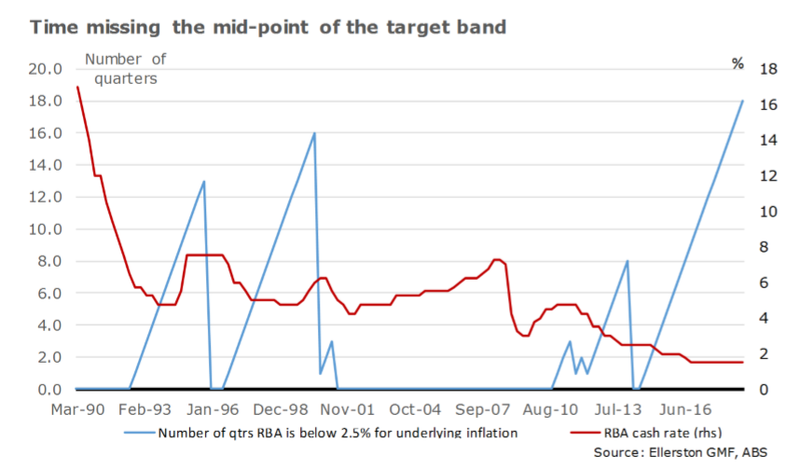 In those days, the RBA used to calculate that number after seeing the full release from the Australian Bureau of Statistics (ABS). And they would release their calculation of the number some 90 minutes after the ABS release. A good economist would calculate it in 15-20 minutes. And so 15 minutes after the release we would be waiting for Andre Morony to breathlessly run out to the trading desk and tell us his calculation. Now if that was a surprise, there was another opportunity to position before the market had digested this. “Money for jam” as Richard used to say. And finally there was a trend. Our analysis at the time showed that when there was a significant surprise on the CPI, the market would “trend” for 3 days on average. So buy on a weak headline forecast, then buy more if the core measure is surprisingly weak, and buy even more because it will trend for 3 days. If that all worked, then ask for an increase in your trading limit for the next number! Alas, those days did not last for long. Fast forward to today, and the market typically just gaps in nano seconds, usually before you have even see the information. Algorithms scan the news service – all of them – for the data release (or any information), programmed to buy/sell the market to a predetermined level based on the deviation of the release from expectations, calculated on past relationships. It’s very hard to make money trading after information these days. But trends still persist. Why is that? Well it takes more than one data print to paint a picture. Yes, the import of a single data print can be instantly priced. But what if there is a series of say strong activity prints. Each time they print, the fixed income market gaps higher in yield. But because the prints are spread out over time, this builds a trend in price. The key now to trends is forecasting a trend in the data, rather than the price. The price will eventually follow. This is why we spend so much time trying to discern where the data will be trending over the next 6 to 9 months. 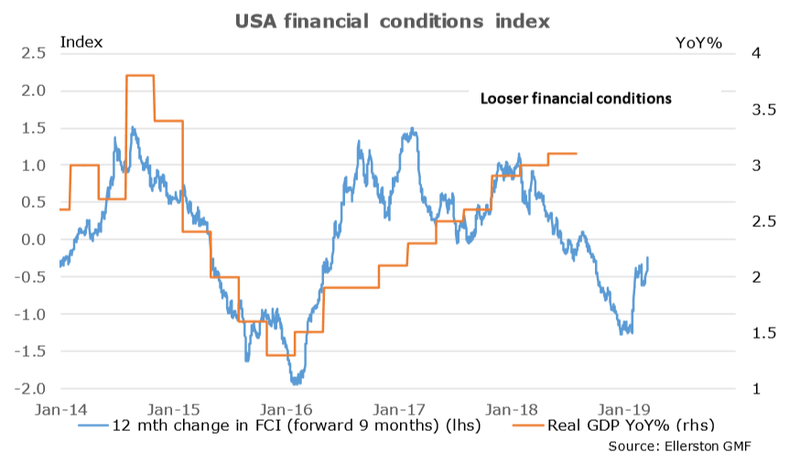 And you see us rely on indicators such as our financial conditions index that absorb and calibrate all the financial data that stimulates or restricts the economy. When we see a significant move in our FCI, we can expect the data releases to follow that signal over time. Over time…The time dimension provides the trend. And dare I say it? I think this year will be a good year for trends! Because we have had a large move in our FCI, and the market is looking the other way. We now expect 2.4% growth in the US in 2019, with a clear acceleration in the quarterly growth profile over Q2 and Q3. Why do I say the market is looking the other way? Well consensus expects US growth to slow markedly into 2020. They are in effect still focussed on the dip to 1.5% in our FCI. Indeed, the US fixed income market expects a rate cut in the next 12 months. Won’t happen. Not if we are right on growth. Which means US 10 year yields will retrace, probably to around 2.8% over coming months. A trend if you will. So will we be right? Well the FCI has been good. But it is not infallible. And so we like to see the regular data conform to the roadmap we expect. And in the last few weeks it has started to do that -in spades. Let’s take it in order. First China. 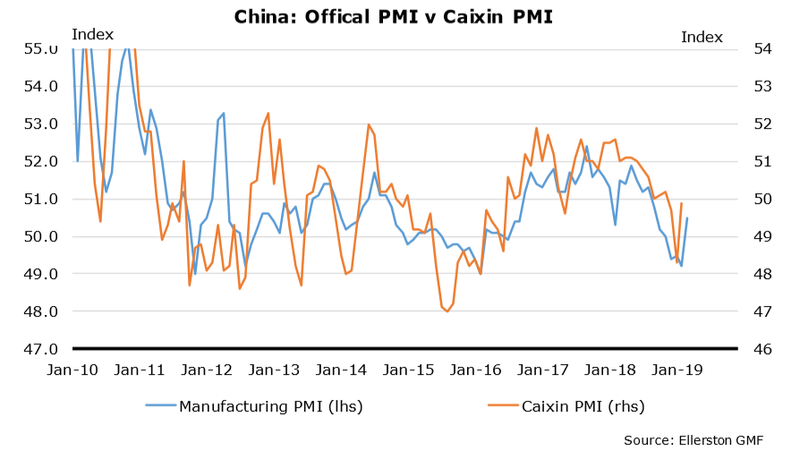 As we know China has been easing. The pop in lending at the start of this year was the largest since 2016. 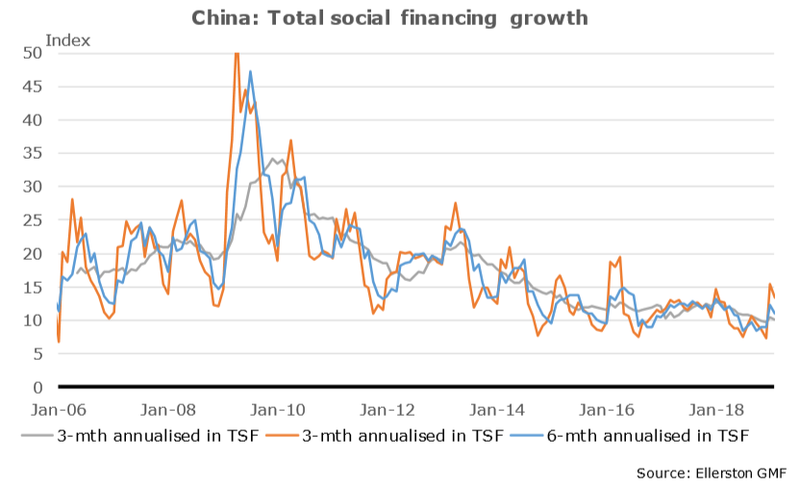 And China’s announced fiscal stimulus is 3.5% of GDP (if enacted). That’s almost equal to 30% of the 2008 GFC stimulus they did that ignited the world. We had been focussed on the easing measures, and so expecting a lift in growth. 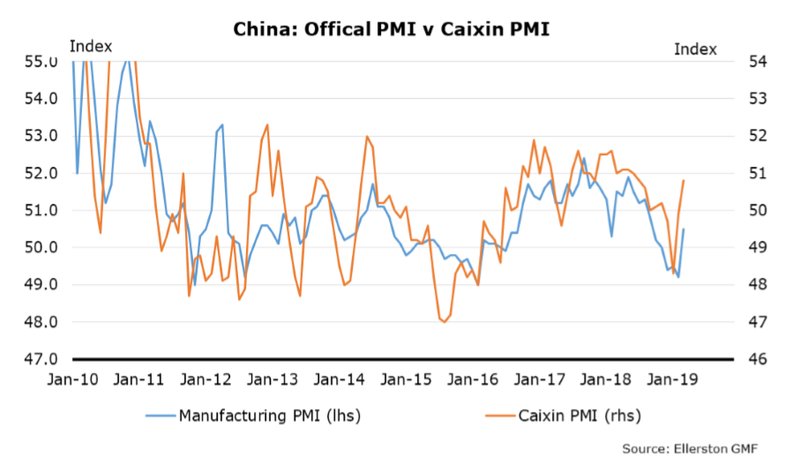 Hence we weren’t surprised by the pop in the China PMI’s early in April. In a highly correlated world for trade, this suggested the bounce in the US PMI could come soon. And so it did. 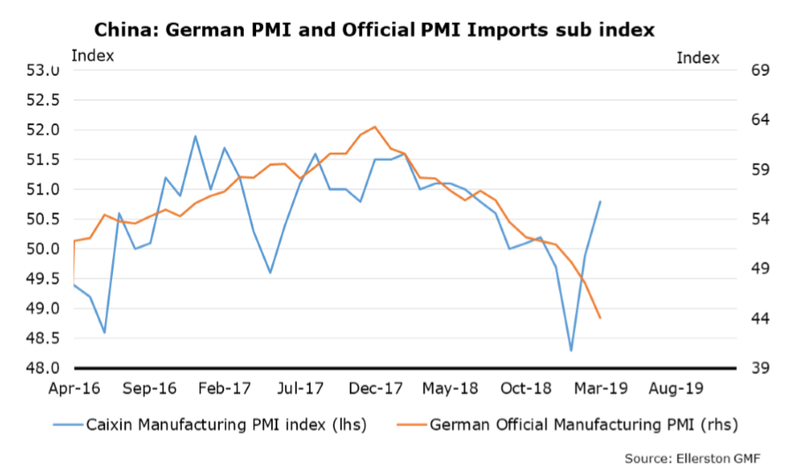 Just as importantly it suggests a bounce is coming in Germany. And this is a bounce the consensus doesn’t expect. 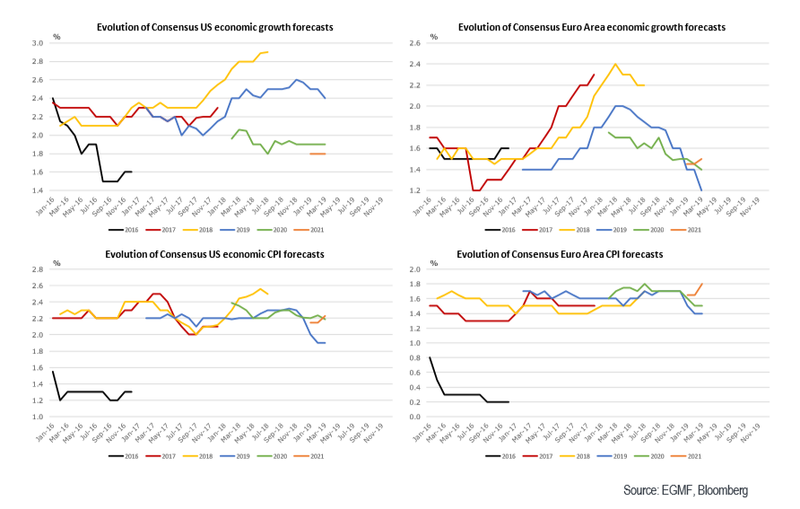 As noted above, consensus sees a sharp slowdown in US growth next year, and have sharply downgraded European growth expectations for this year and next. So we have a trifecta of timing here. Yet our FCI’s have eased significantly, suggesting stronger growth ahead across the globe. And the data has now started to turn. Indeed, we track the data surprises to gauge timing. The chart below prints below 100 when activity data is weaker than consensus, and above when stronger. It looks a little bit of a mess doesn’t it? But there is actually an interesting message there. The data doesn’t stay a lot weaker than consensus, or a lot stronger, for long. Look at how much time the indices spend above 102, or below 98. Not long. Why? Because consensus extrapolates, whilst data tends to mean revert. A few weak data prints and we are having a recession, or so they say. You know the plot. So consensus expectations for each release keeps getting lower and lower. But the data more often than not reverts. And so the consensus is surprised it is not so weak. And so on. The point of the chart is that once these measures hit extremes we are likely to see a run of data surprises going the other way. Err, except in a recession. So is this a recession this time? 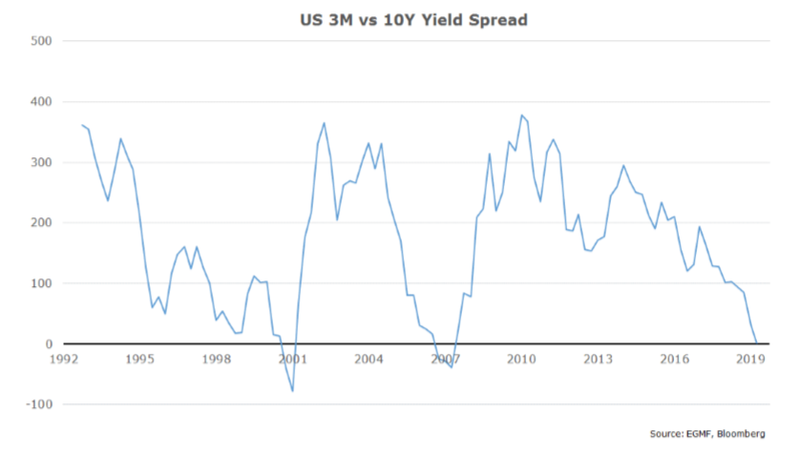 Many are pointing the inversion of the US yield curve to argue such. But we don’t think so. We find our FCI is a much a more reliable signal of growth than the yield curve. And we find that the 10 year bond in the US is still being suppressed some 70 basis points by global quantitative easing and negative rates. So we believe the US yield curve signal is a false signal. To compare to past signals, we need to add 70 basis points to the 10 year rate, placing the curve around 80. That would not be at all concerning. Indeed we view the low 10 year rate through a very different lens; the suppressed US rates at the long end are supporting the economy. Growth hit a pot hole. But the Fed is gone (all the way back to the 60’s in my mind – happy to run a tight labour market and allow inflation pressures to build). And the other 3 have/are passing. We have moved through the pothole (perhaps with a little damage to the undercarriage, resulting in our 2019 forecast about 0.3% lower than we had pencilled in last year). The good news though is this should be the year of trends, at least in rate markets. Why? Firstly, the stronger growth picture that we are talking about will evolve in line with our FCI’s over a number of quarters. The data will incrementally build the case. Secondly, the markets (and economic consensus) are priced a long way from what our forecast would dictate. But most importantly, “Elvis has left the building”. Elvis of course being the Fed. They will not re-engage for quite some time. 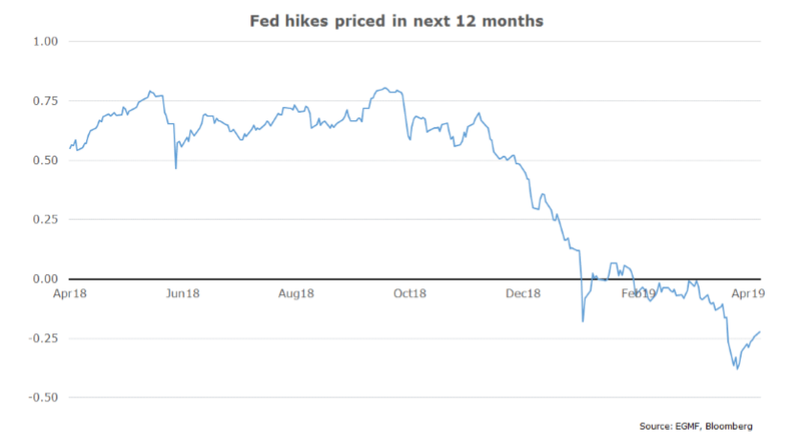 Remember 2018 was about the market adjusting to the Fed normalising rates. “Things” broke. Carry trades in particular. The Fed ain’t going to break anything in 2019. And so the economy will slowly recover, following the improvement in the FCI. Indeed, as equities grind out a rally and credit tightens, the FCI will likely ease a little more (though offset by gradually rising bond yields). 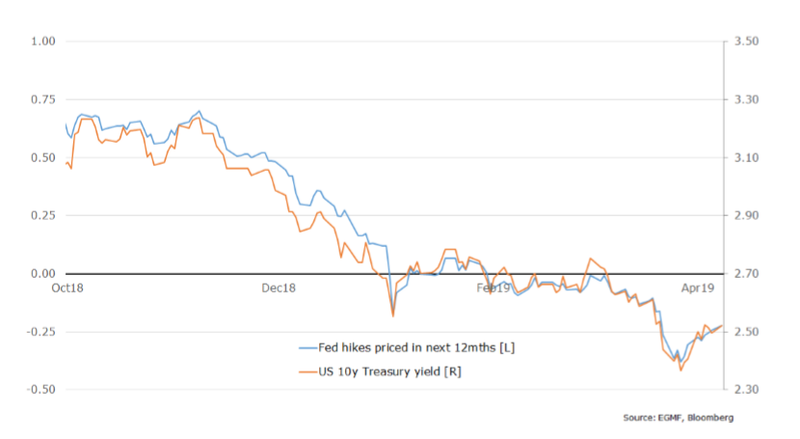 First step for the market, likely over the next 2-3 months, will be to remove the easing priced in US rates. That would take treasuries to 2.8ish. The next step will be more grinding. As the unemployment rate continues to fall towards 3%, and wages rise towards 4%, and inflation to 2.25 to 2.5% by the end of this year, the Fed will likely deliver a “reluctant” hike. And likely just one. They will be very slow. So that would suggest US 10’s around 3% by year end. To go much further will require clear evidence that inflation is rising. And as I wrote last month, that might take 6 months. Or it might take 2 years if corporates continue to eat into their profit margins. Neither scenario is particularly good for stocks. Particularly with US equities already expensive. But they can still grind out high single digit returns until it is clear inflation is rising above 2.5% and the Fed has to re-engage. What does that all mean for the portfolio. We are carrying a large short position in US rates. We were a bit early last month, which hurt performance. But we have added to the position coming into April, and are excited by the potential. Recall we had two other core positions in the portfolio last month. Long rates in Australia, looking for rate cuts. And short EURGBP, looking for a Brexit resolution. The Australian rate cut trades performed well in March. And with one full cut now priced by August, we have significantly reduced that position. 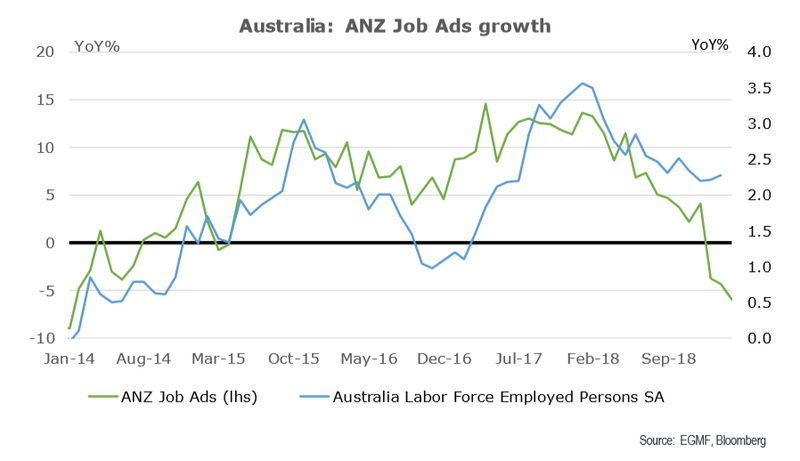 Nonetheless, the prospect of two rate cuts in Australia this year remain strong. 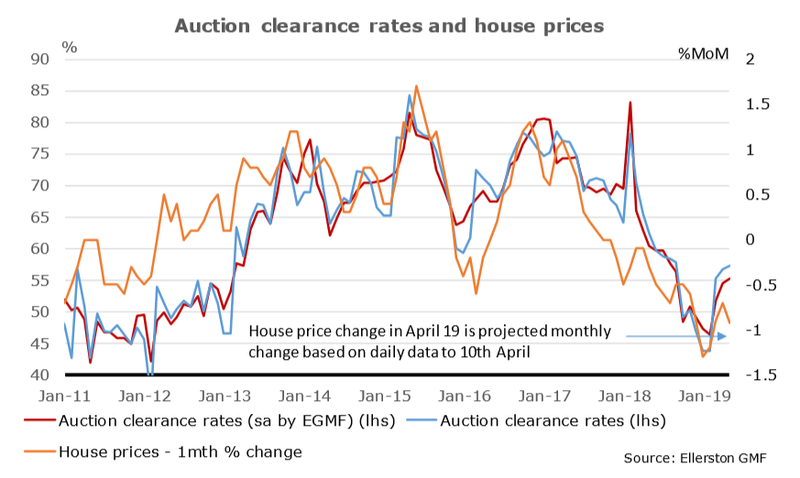 House prices continue to fall, with early indications for April pointing to another 1% decline. 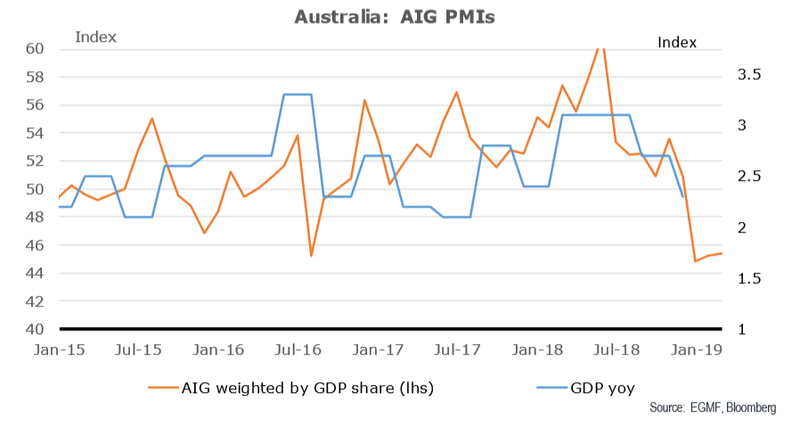 And there has been no bounce in business confidence, which now suggests Australian GDP growth will slow to 1.75%. The RBA will have to downgrade their growth forecasts in their May outlook. 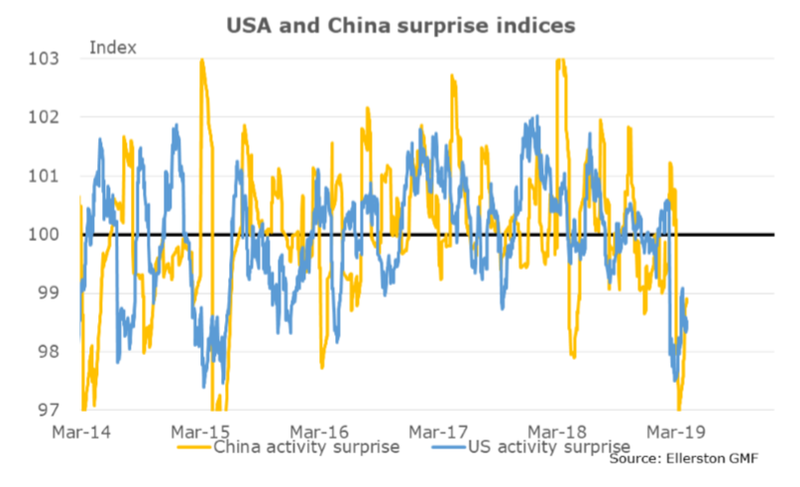 Indeed, their statement in April hinted that they are getting concerned (they changed the outlook paragraph for the first time in 13 months, suggesting unchanged policy was appropriate “at this meeting”). We expect the RBA to downgrade their forecasts and formally acknowledge an “easing bias” in May. Indeed, let’s not forget that they have a statutory mandate to deliver inflation on average of 2.5%. They have never missed for this long. And with the growth downgrades we expect them to do in May, they cannot sincerely forecast returning to the band without rate cuts. We then expect the data to be weak enough over coming months to justify that (first) easing being delivered in June or July. Not least because employment will soften. So we are still positioned for that, albeit the risk/reward is not as good now with 47 points of rate cuts priced over the next year. Nonetheless, there is only 23 points priced by August, and we suspect the 50 could be delivered by then. So that is where we prefer the risk reward. And Brexit? God help us! As I write we have May turning her back on her own party and negotiating with Corbyn. If they come to an agreement, and that is a big if, it will be a Custom’s union, which for the UK economy would be a big positive relative to other possibilities, and GBP would strengthen significantly. The EU’s chief Brexit negotiator, Michael Barnier, is even suggesting this could be achieved before May 22nd, so the UK would not have to participate in the EU elections. The likelihood of that? Low. Let’s say a 10 to 30% chance. More likely we have a long extension granted by the EU, and no resolution in Britain. Which would probably end in a UK election, despite no one wanting one. And the prospect of Corbyn winning would certainly not be good for the Pound. So before we get to a UK election, there would still be desperate efforts by all participants to try and pass some sort of Brexit. Fluid to say the least, and so far this has not been ideal for our EURGBP trade. But at the same time, the trade was designed to weather this sort of noise. Recall the trade looks for a weaker EUR v GBP. But more importantly, the trade looks for the pricing of volatility to fall dramatically once a Brexit is resolved. How do we do that? Below is one example. We own a put on EURGBP. But owning a put is very expensive. 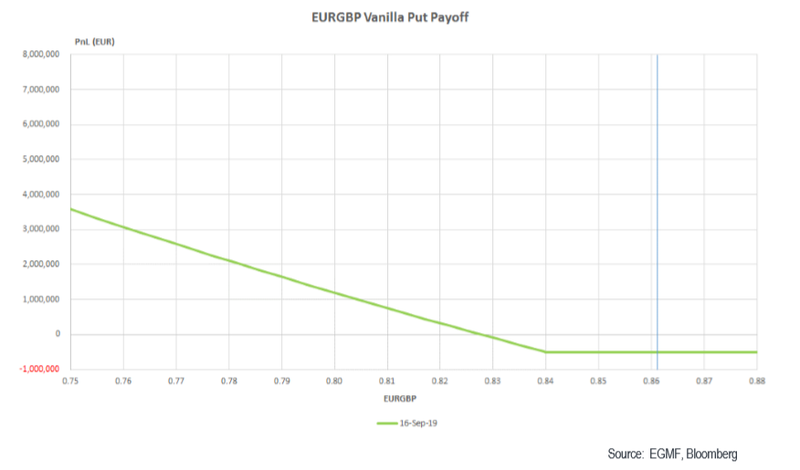 For example, if we held a vanilla 0.84 put expiring in 5 months, we would have the pay-out below. If we had a customs union, and no election, we would expect EURGBP to make its way to somewhere around 0.78-0.80. About a 3:1 pay-out. But when volatility is high, the market is fearful of a much larger move. And if we are willing to have our option be cancelled (knocked out in market parlance) if the currency moves a long way, we get a significant discount. Hence one trade we have below. The 84 put, but it is knocked out if the market trades 0.76. This improves the risk reward to about 8:1. 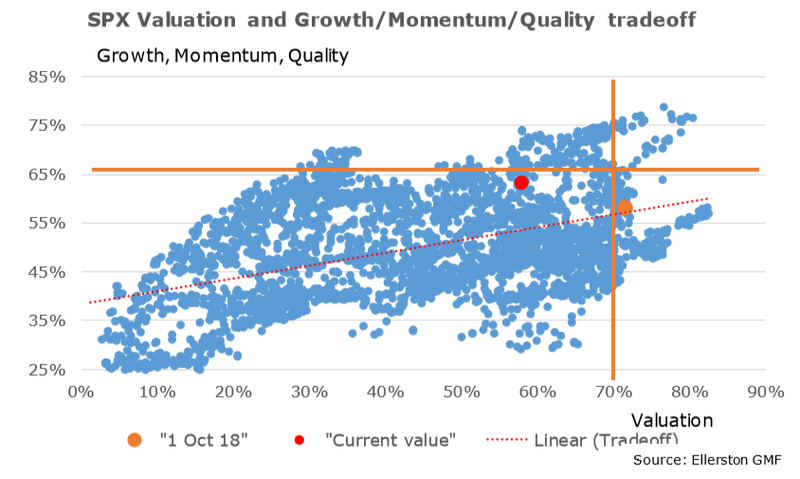 But just as importantly it suffers much less time decay than an outright put when the market is above 0.84, but has positive time decay (and is “short” volatility) when the market is below 0.84. If we are below 0.84, that likely means they have positively resolved Brexit. That is exactly when we want to be “short” volatility, and that is where most the return in this trade will come from. We have a dozen or so of these trades, over different strikes and time horizons, which we put in place whenever volatility was high over the last 4 months. A positive outcome will still give us an 8:1 return (approximately across the portfolio). Although it is still hard to handicap the odds of a positive outcome, we still like having exposure at this risk reward. We are risking about 0.5% of capital, to make 4%. One out of three performed in March. But we feel very confident about the US rate view, and maintain suitable risk on the Brexit outcome. And we are looking forward to some trends! Stay up to date with the latest macro news from Ellerston Capital by hitting the 'follow' button below and you'll be notified every time I post a wire. Investing with a macro view, will take advantage of themes that do not rely upon positive market performance. Want to learn more about big picture investing? Hit the 'contact' button to get in touch with us or visit our website for further information.